How can a band like Muse ever top itself? Being the most bombastic band since Queen, after nearly 20 years everything must have been tried out one way or another? I would have thought so. Having read the first reactions to the first songs released from Simulation Theory I would have expected that the answer to the question above must have been yes. In fact it is no. 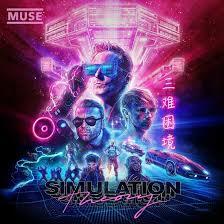 With Simulation Theory Muse appears to have delivered its most complete album to date. And yes that is surprising but also invigorating. Bands can improve themselves after 20 years in business. With 'Drones' Muse had kicked life back into itself in my opinion. The attack in the music was back. Although towards the end of the album some fatigue settles itself in my ears. Not so with Simulation Theory. The build up on this album is simply superb. There's a place and time for everything. Rock, dance, George Michael pop, prog, Queen and classic hardrock. Muse incorporates it all in a perfect blend. In fact I bought the cd as I enjoyed the music even into the remixes. The album starts with a drum beat. Arctic Monkeys? Yes, the beat sound very, very familiar, but continues for too long and immediately the song turns a sharp right into 'Algorithm'. A medium sized rocker pleasing ear and mind. A rocker with synths, piano parts inspired by the classics. 'Algorithm' sets the stage for the whole album. Almost anything is possible the band seems to convey. In 'The Dark Side' the more poppy side of Muse is allowed in. A dance rhythm and a very pleasant melody carry the song home. 80s bands like Erasure are remembered fondly it seems. This combination is the secret to this album. Muse is exploring all sorts of directions in its music but it all comes with a golden melody wrapped around whatever it puts to its audience. Accompanied by a great, full sound Simulation Theory can be overwhelming and all absorbing. By taking away that layer every once in a while the album shows some fragility as well. Muse is able to present it all within the confines of a four minute song and takes the listeners on a listening trip of fairly unique proportions. Just listen how the mood goes up and down in 'Blockades'. From the huge beat, the Bryan May like reverse sounding guitar solo, to the soft bits in the verses. Muse gets away with it all. This song could have been 100% kitsch, yet here it is a great rock song of some epic proportions. Hearing 'Dig Down' for the first time I was seriously wondering why the music controlling team of Muse's record label could have passed this. Let's face it, the chorus is nearly 100% "Freedom, freedom, freedom, what you give is what you take, yeah yeah, yeah". The rest of the song is not, true. 'Freedom! 90" is my favourite George Michael solo song, so I'm not complaining here. 'Dig Down' is the song in which Muse takes off the power house and shows restraint in a superb way. And exactly that is the reason why I like Simulation Theory so much. Muse has found the balance between its extremes. Where I in the past could not really listen to a whole Muse album because of either too much bombast or too much reticence, here I have the best of all Muse excels in. Whether extreme sounds, extreme bombast, holding back, classical influence and Queen of course, it is all mixed into eleven great songs and five alternative versions with me not either turning the record off or skipping a song here or there. Add to that all Matthew Bellamy who is in great form as a singer and it seems Simulation Theory is a ***** album.